Can anyone give me any info on the Kirkdale Library , Brock Street please? The County Sessions Room (County House of Correction), Kirkdale, was opened on 5 November 1821. After the Gaol was demolished in the 1890s it became a public library until the 1950s when it too was demolished. Last edited by PhilipG; 11-15-2008 at 07:13 PM. (Social Security for our younger readers) offices nex to it. Here's an example of copying down information from different sources. My previous post came from (I think) a book about Kirkdale Gaol, and the following is Liverpool Libraries own version, which should be accurate. I don't know if the library in Brock Street was completely new or a rebuilding of existing premises. The cost is about right for a new building. I can't confirm that it was the War that resulted in its demolition. In answer to your earlier question, there isn't an easy way to find out if any particular building was destroyed in the War, but with it being a library, I'm sure I should be able to find out. You'll see that the building in GD's photo opened as an Evening Reading Room in 1911. I don't know when it closed. 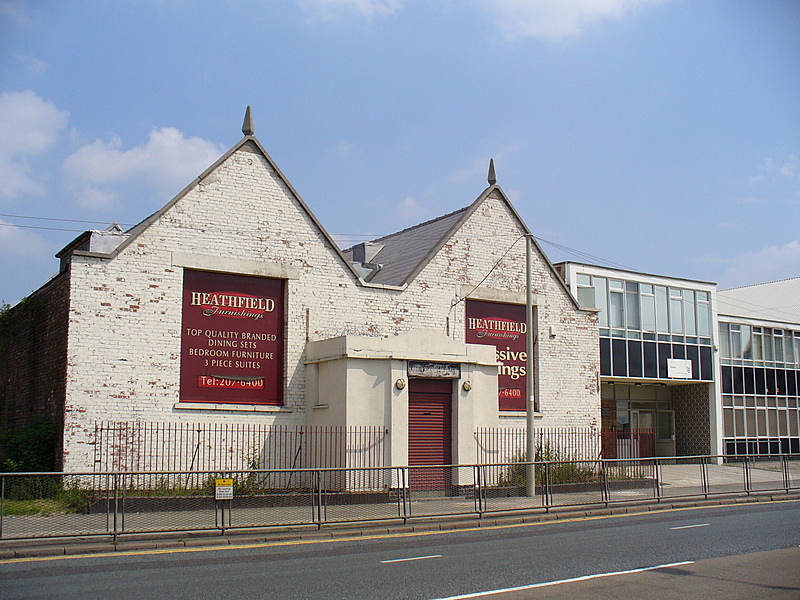 Kirkdale Branch Library, Brock Street/Sessions Road. Opened 21 June 1905. Cost: ?9,837. Architect: Thomas Shelmerdine. Demolished WW2. Evening Reading Rooms (Carnegie), 150 Stanley Road. Opened 13 June 1911. Architect: Thomas Shelmerdine. Cost ?2,351. Last edited by PhilipG; 11-16-2008 at 07:19 PM. That picture was taken last year it looked much better when it was used as a libary,the low walls on the sides of the door had forged railings on them. The entrance had lovely varnished doors with windows in them. I visited nearly everyday,even got my adult ticket 2 years before I was eligible because the staff knew me. Happy days I as able to get my C S Forester books. Regarding the site I suppose because it was on a main road where all main libaries tend to be, and the Rec was used as a play area with the bowling greens and lads playing football even though there wasn`t much grass. I live opposite the site of the old library I'm told by neighbours it was demolished because of war damage. It had Brockmoor Tower high rise flats built on it latterly and they were demolished and despite resident protest new houses built on the land, which didn't sell and remain largely unlived in 2 years later. I would love to see a pic of the old Sessions House but all I've found so far is the Kirkdale Gaol, which loked like a Venetian Palace it was so posh! I'm sure it wasn't inside -read Ted Sloan's book for more detail. I have written a fictional children's story about the prison. The rec has the pathways laid out exactly to the prison plan. The tree opposite ours I fought not to be demolished by the builders, a lovely lime tree-The park is well spooky on a foggy night and the Sessions pub now gone was a bit creepy in the cellar I heard. North Liverpool is steeped in history and www.liverbirds.org.uk is the home of Pride in Liverpool and we are hoping to collect some more history from our schools and communities project. Hope this info helps and please if you ever do find that pic of the Sessions Court House let me know I would love to see it! i lived at 48 garnett ave from late 42 - early 43 until my family moved to walton around 1950. my gran , aunty and two cousins remained at No 48 'til about 1970 when my gran passed away. i distinctly remember the library was completely gutted , along with the bottom of garnett ave / brock st. and medloch st. being flattened . as kids we played on the Debrey [debris] and in and around the library . the library must have been a great land mark for 'jerry' to pinpoint it's load of incendiary bombs , that's what i was told done the damage , though a few years ago during a visit back home , my brother and i went to garnet ave and by chance met the present owner of No 48 who invited us in .it was an incredible feeling walking through the house that held so many fond memories though tough at times . the owner insisted that it was a barrage balloon that had come down , burst into flames and done the damage at the bottom of the avenue ?. incidentally the bomber may have been targeting the big modern tannery that was next to the library , that is if my version is the correct one ?.so from the early 40s the library was just a shell though the walls seemed undamaged . it's style would not have been out of place along side the city library. the museum and the walkers art gallery .it was a grand building but seemed out of place. it stood in about one and a half acres surrounded by 8ft high wrought iron railings that had been taken as scrap for the war effort , i think it was built of solid sandstone , the roof was gone. i can remember the more daring mates climbing the walls and walking across the girders [about 20 ft high ] from one wall to the opposite wall like burt lancaster and nick cravat in 'the crmson pirate' except the oldest would have only been about ten years of age, i shudder when i think of what we got up to. we had no fancy electronic games , no niki runners, in fact it was only the posh kids that had pumps and there wasn't any posh kids 'round our way, but we still had great fun and the friendship was a great substitute for wealth . i'm 73 next birthday and been living in australia for the last 37 years but i'm still a through and through scouse from my thinning hair to my curly toenails. and i really love this site. hope my info reaches you. Thanks FRANKOZ for this interesting post. I am hoping to get together a book on the area later next year, certainly do a project on memories. The library was the former Sessions House, hence the graendeur. I have a pic of the sessions house and just recently acquired a book inventory of the titles the library held in the early 1900s and I can tell you some of those titles sounded very dodgy! Those Victorians , I dunno. Anyway I live in the 1954 built new houses at the bottom end of the road so presumably where the barrage balloon went down . I do have a great pic of Kirkdale Bowling Club 1900s which I hope to publish in the book. This would have been taken in the rec. The Stanley Park library as was is now next door to the Probation Service building. I still remember it as a library in the 80s. I am interested to know if anyone has memories of a fever hospital in the Westminster Rd area Whitefield Close area as is now behind Garnett Av-it was there in the 1840s census? Good luck with the book as my in-laws and their parents before them live in Kirkdale so i'm down there every weekend.